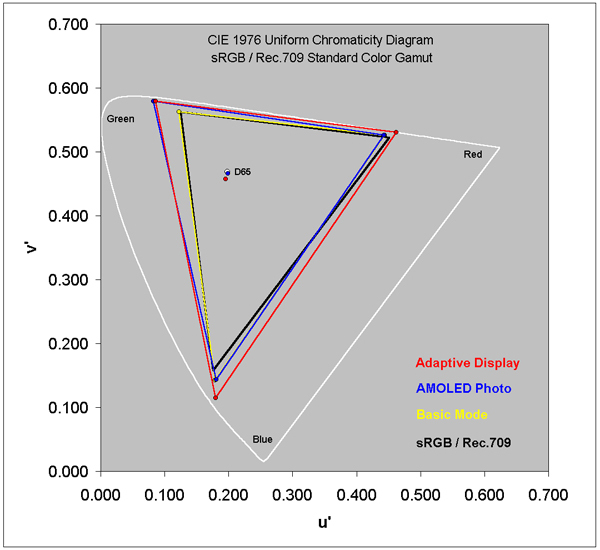 Figure 1 below shows the measured Color Gamuts for the Galaxy S7 Screen Modes along with the Standard sRGB / Rec.709 Color Gamut in black. The outermost white curve is the limits of human color vision - the horseshoe is the pure spectral colors and the diagonal is the Line of Purples. A given display can only reproduce the colors that lie inside of the triangle formed by its primary colors. Highly saturated colors seldom occur in nature so the colors that are outside of the Standard Gamut are seldom needed and are unlikely to be noticed or missed in the overwhelming majority of real images. Note that current consumer content does not include colors outside of the Standard Gamut, so a display with a wider Color Gamut cannot show colors that are not in the original content, and will only produce inaccurate exaggerated on-screen colors. The dots in the center are the measured color of White for each of the Screen Modes along with the D65 Standard White, which is marked as a white circle. To deliver accurate image colors for standard consumer photo and video content the display must match both the Standard Color Gamut and the Standard Color of White. The Basic Screen Mode is an accurate match to the sRGB / Rec.709 Standard that is used to produce virtually all current consumer content. The AMOLED Photo Screen Mode is an accurate match to the Adobe RGB Gamut that is used with high-end digital cameras and advanced imaging applications. The Adaptive Display Screen Mode has a Wide Color Gamut and is intentionally vivid. See this Figure for the Absolute Color Accuracy measurements for the Screen Modes. Note that some of the Screen Modes are similar and their Gamuts and White Points overlap in the Figure. The white circle marking the D65 White Point is covered by the very accurate White Points for the Basic and AMOLED Photo Screen Modes.